The 2013 Honda CR-V remains a perennial best seller due to its smart styling, clever use of space and excellent fuel economy. Honda's near bullet-proof reputation for quality and high resale are two more reasons so many people love this little SUV. 2013 Honda CR-V with AWD and built-in nav. I purchased the CR-V with the built-in navigation system, which I love, and that particular trim package also came with XM radio capability, heated seats and a back-up camera. These are all items that I never would have thought to add on, but now I do not know how I lived without them for so long. I do wish there was some kind of automatic update for the navigation system rather than having to purchase a manual upgrade periodically, especially since it never seems fully up-to-date with all road and location changes. The mileage is reasonable, and I love the AWD for the northeast winters. That combined with the anti-lock brakes and stability control has proven indispensable time and again. I find the car quite comfortable to drive, but my big & tall boyfriend finds the passenger seating area to be a bit cramped. I do keep it regularly maintained at the dealership, and additional wear and tear repairs have been minimal. In general, this car has not disappointed me. As my fourth consecutive Honda (out of the five cars I have owned in my life), it has satisfactorily continued my enduring and reliable relationship with the Honda brand. I bought a 2013 honda crv AWD in 2014. It just has the basic nothing fancy. When I bought this vehicle it was use with only 12,000 miles. At 30,000 miles I notice that the SUV flutters or trembles as you accelerate after stopping. I talked to a lady that own the same vehicle and year and she stated it was the Torque Converter. After taking it to the honda dealership the machanic there also said it was the Torque converter. Honda put a new Torque converter on the vehicle free of charge since it was still under warranty. The vehicle since then been running fine. However, a machanic told me that the Torque converter is part of the transmission and honda should have just put a new transmission in my car. He also stated once my vehicle gets high miles I will start having transmission problems. Now my crv has 57,000 and I'm afraid I might have problem due to the Torque converter was change but not the whole transmission. No other major problems other than that. 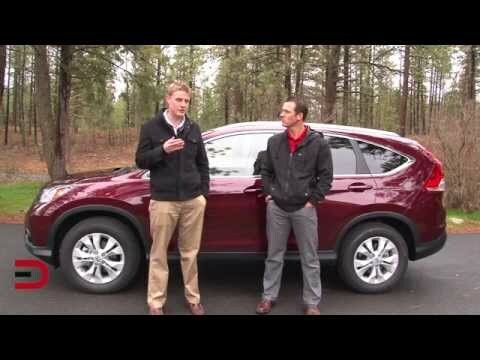 Why the Honda CR-V is the best car in town. I really love my Honda CR-V. It has great visibility from the driver's seat. The controls are easy to understand and use. I like the safety features that tell me when I need to put air in my tire or when I am hydroplaning etc. It is very comfortable to ride in for long road trips. My car gets great gas mileage and runs very smoothly. I like the flexibility in the trunk, with a plastic board that I can use or take out. I can create a second layer in the back if I need to stack a lot of things, which is really helpful. I love the radio feature, and I like how the buttons light up whenever my lights are on, making it much easier to see at dusk/night time. Honda has always been a reliable brand and so far I have had no trouble with my car. With regular upkeep the Honda CR-V is a fantastic car.